Archipelago ferry routes and schedules - Sail in Finland! The map in this post has been superceeded by a great online service over at the site saaristolautat.fi . Use the website instead! More information also here. For a boater, the Finnish archipelago offers a multitude of destinations and you can spend as much time visiting the various islands as you want. Sometimes however, you might have the need to move around in the archipelago in some other way than on your boat. It could be a crew change or you expect visitors or you just want to make an excursion to the mainland perhaps. In that case the archipelago ferry routes help. 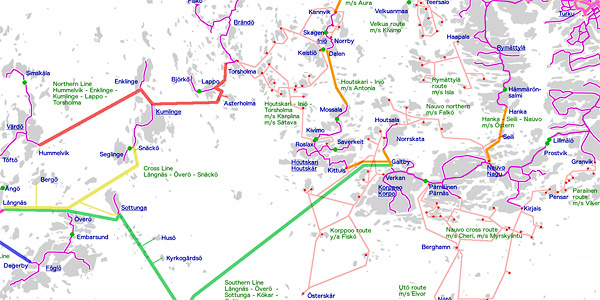 The good news is that the Archipelago sea (the body of water between the Finnish mainland and the Åland islands) has a very good ferry network servicing the main islands and connecting them with the Finnish mainland and the Åland main island. The ferries are used by locals and visitors alike and the best thing is that a lot of the ferries are free. 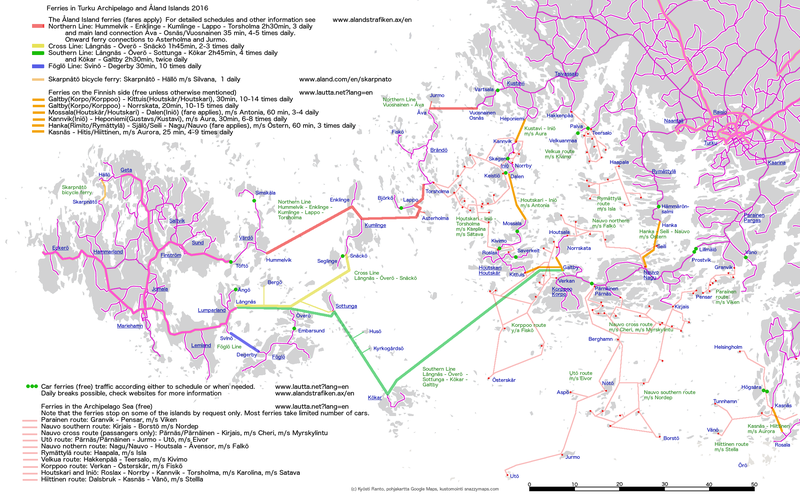 Kyösti Ranto has done a great job in collecting all the ferry routes into this very clear infographic. As you can see, you are never more than a few miles away from the closest place where you can hop on a ferry. Kyösti maintains the map on a dedicated Facebook page, check the page for updates (the maps on this page are currently 2016 status). Most of the information on the ferries including schedules can be found via the website ferry.fi (for the ferries on the mainland “side”) and alandstrafiken.ax for the Åland ferries. Click on the small map below to open up a bigger version of the map and start planning. Click on map for a bigger version! 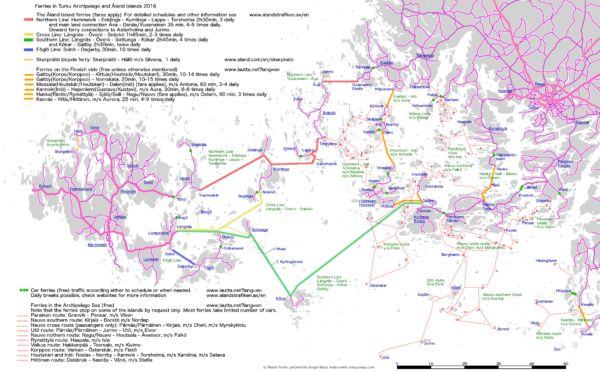 ps: In case you want to explore the archipelago in some other way than by boat (eg on a bike or by car), note that the ferries create 4 different “circular routes”. Counting from the right (Turku) you can find the “Small archipelago trail (Turku-Nagu-Rymättylä-Turku, daytrip), the Archipelago Trail (Turku-Nagu-Korppo-Hourskär-Iniö-Kustavi-Turku, 2 days), the Kökar route (Turku-Nagu-Korppo-Kökar-Långnäs/Åland-Kumlinge-Åva-Kustavi-Turku, 3-4 days) and the longest route (Turku-Nagu-Korppo-Kökar-Åland island/Mariehamn-Vårdö-Kumlinge-Åva-Kustavi-Turku, a week).